Earlier this week Maclean’s released their popular Chart Week post. The article highlights 91 of the most important charts to watch in 2018. 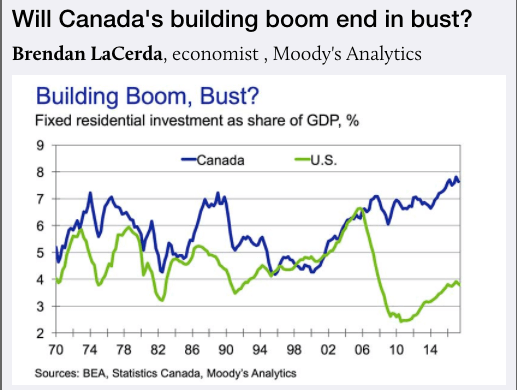 There were some excellent charts relevant to the Canadian housing market which i’ll summarize below. Ben Rabidoux is a great follow on Twitter (@BenRabidoux) with excellent research and analysis on the Canadian lending space. “Since the early 90s, Canadian homeowners have seen continuously decreasing monthly mortgage payments at renewal. By our calculation, for every $100,000 borrowed, consumers have seen payments drop on average $91 per month for a standard 5-year fixed rate mortgage at the end of their first term due to prevailing interest rates that have been progressively lower than at origination. 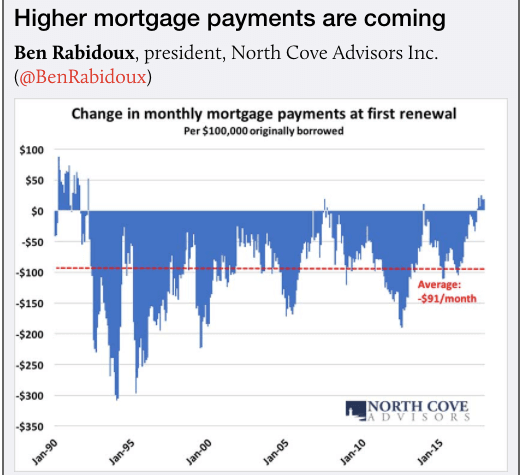 With the recent rise in rates, we’re now at the point where the average consumer is seeing monthly payments rise at their first renewal, something we haven’t seen on a sustained basis since the early 90s. Granted, household disposable income was rising at a 5.2 per cent year-over-year clip as of the second quarter (the highest rate in seven years) but rising indebtedness has meant that the share of disposable income devoted to debt repayment remains 130bps above long-term norms. Canadians don’t have a ton of wiggle room here. Skeptics have long underestimated the resiliency of the Canadian consumer, but this may finally be the year when they tap the brakes. In addition to rising mortgage payments, house price appreciation is rapidly decelerating nationally according to the MLS house price index. Along with that, new mortgage rules coming into effect in January will see homeowners who wish to refinance have to ‘stress test’ against a higher qualifying rate. This could significantly curtail ‘home equity extraction’, an important driver of household consumption both directly and indirectly by freeing up income through consolidating higher interest consumer debt into lower cost mortgage debt. 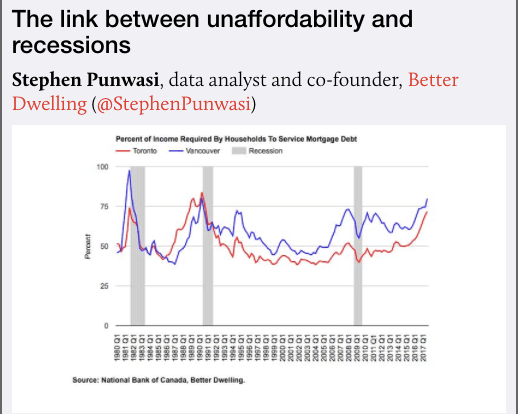 Good friend Stephen Punwasi (@StephenPunwasi) has done some excellent research over at Better Dwelling. Check them out. This one is important. Households are spending and much of this has to do with increased home equity spurring consumer confidence. Savings rates are plunging and household debt levels are at record highs but consumers don’t appear worried thanks to rising home equity. Consumer sentiment could reverse drastically if house prices drop. 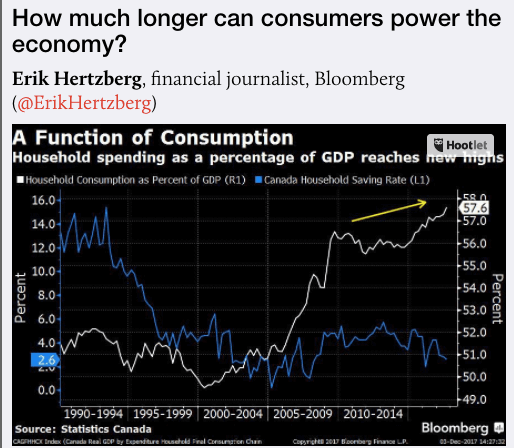 “How long can Canadians keep spending like this? Recent figures from Statistics Canada show household expenditures now comprise 58 per cent of the country’s total output — the highest proportion in data going back to 1961. The second and third quarters of 2017 combined saw the strongest household spending contributions to growth since just before the 2008-09 recession. “Canada’s shadow banking sector, which is comprised of those companies that have more flexibility in providing lending arrangements than the banks, has become a key component of our economy. 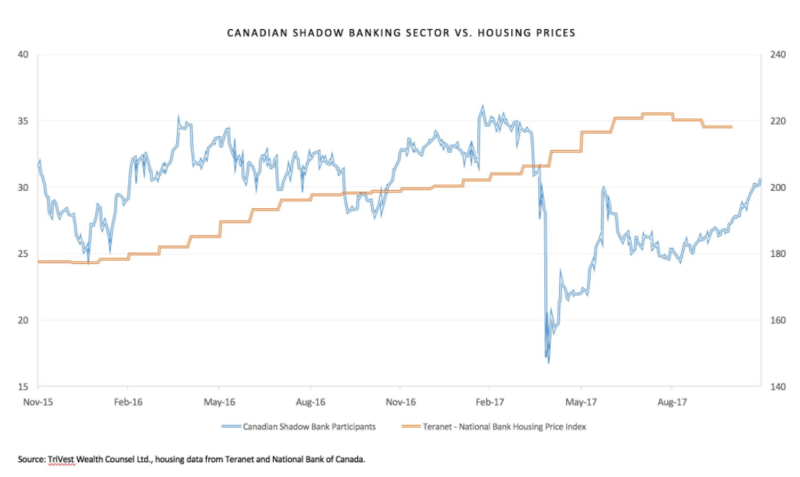 According to the Bank of Canada, shadow-bank lending has grown to represent roughly 40 per cent of the traditional banking sector and over $1.1 trillion in liabilities. The role of this sector is growing in importance given the move towards tighter mortgage lending requirements being imposed on the Canadian banks. Additionally, it provides a liquidity option for the banks to offload their higher risk mortgages thereby improving their balance sheet positions. Many have considered sub-prime spin-outs but not surprisingly there has been little interest after being tainted from the financial crisis. 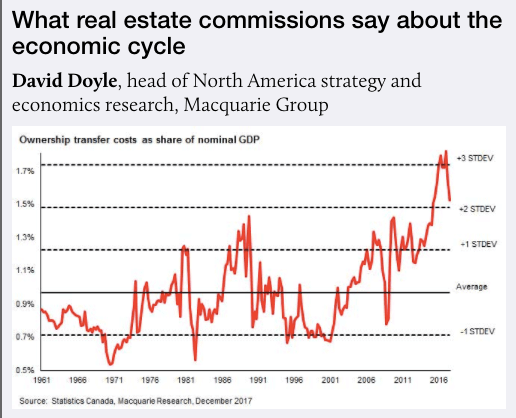 All of this is contingent on a rising housing market to substantiate loan-to-value ratios, and a halt to the interest rate hikes by the Bank of Canada. However, there was some serious trouble this past summer among one of the largest lenders in the space but a solution was found at the wire to help stabilise the situation.